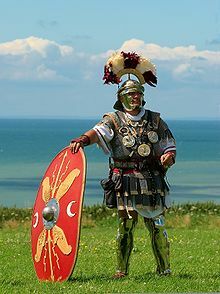 A heestorical reenactor in Roman centurion costume. Note the transverse crest on the Galea (helmet). It wis worn tae indicate the wearer's rank in regimental 'triumph' an honoreefic parades. Its purpose wis purely seembolic. In ordinary events, it wisna pairt o the staundart battle-dress o Roman soldiers in the field. A centurion (Laitin: centurio; Greek: κεντυρίων, kentyríōn, or ἑκατόνταρχος, hekatóntarkhos) wis a professional officer o the Roman airmy efter the Marian reforms o 107 BC. This page wis last eeditit on 29 Mey 2018, at 21:59.